Forget about tight shorts shorts. Oversized shorts is slowly creeping in as a summer trend and I immediately jumped on the oversized shorts bandwagon! I’ve been spotting oversized shorts on every Asian webshop. When I saw the shorts for a bargain on Ebay, I immediately clicked ‘buy now’. The best thing about these shorts is the comfort. It is an absolute pleasure to be wearing shorts where your thighs can actually breath. Forget about tight shorts, I am moving on to the oversized version! If I haven’t already said ‘oversized’ enough, I paired the shorts with my oversized vintage shirt. I chose heels for this outfit just to make my legs looks longer. Some platform sneakers will do the same trick! So please, indulge yourself in some oversized comfort and buy yourself these shorts. They are an absolute delight to wear! i love the shorts! i’m such a fan of oversized clothing, i think on smaller frames it’s so much more flattering! Very chic oversized shorts! Stunning look! Hola guapa! gracias por comentar en mi blog! me gusta el tuyo y tu estilo! los pantalones cortos son ideales! así que te sigo y te espero si te apetece! I’m so in love with your Forever 21 heels, dear! Would you like to follow eachother on blogger, GFC and blogovin? In love with the short! 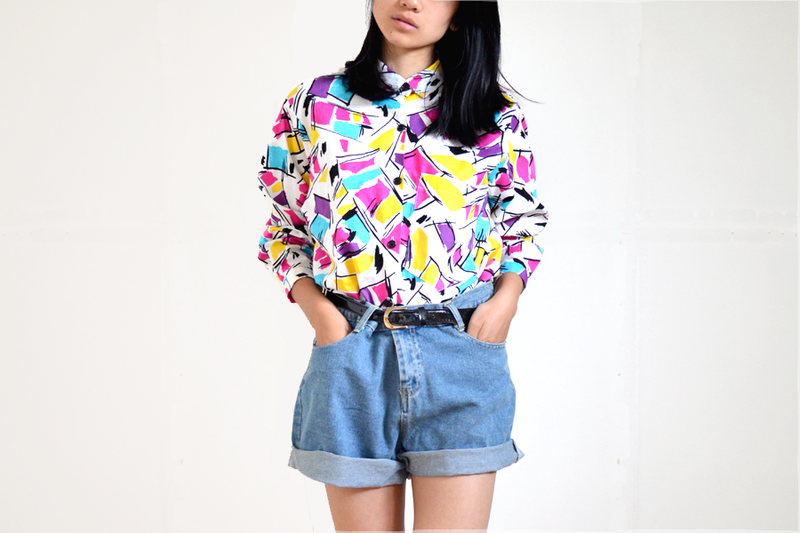 Love the oversized shorts with this pattered top!! liking the oversized shorts look with the chunky heel! it’s such a cute outfit!! I’m in love with yout outfit! Also your shirt from Jutka & Riska is amazing! I love the shorts! I am always finding myself in boyfriend shorts lately… They are just so comfortable and I love pairing them with dressier tops like you did here. So glad I found your blog! That top is awesome! So ’80s. You look gorgeous with this short. this is so cute! the shorts are so unexpected but i love it! your outfit is so chic! I love high waisted shorts. And they go so well with that blouse! I think this shirt is perfect. I love the whole look. Thanks for the comment on my blog. I am now following you. That bright top is super flattering! I love oversized clothing on small frames. You nailed it, love.